Living in Los Angeles means that you don’t get much rainfall and, when you do, it usually isn’t much. Due to this lack of rain, many homeowners do not think to safeguard their homes against precipitation of any kind. This means that when a storm does finally hit, many homes are not prepared for the damage that can be inflicted upon their property. The rain can exposed roof leaks, foundation cracks, damaged gutters and downspouts, and faulty plumbing systems that all seemed to work fine before the storm. Since Los Angeles residents are not familiar with storm damage, it is important to be aware of any issues heavy rainfall can cause, even if it only does occur once a year. The part of the home that will take the brunt of the storm is your roof. During the dry season, which can sometimes be all four in Los Angeles, the roof does it’s job perfectly, but when rain suddenly impact it, fractions and cracks can become realized. Not only can the rain get into the home through roof leaks, but the gutter and downspout can make it easy for moisture to make its way into the interior. If there are any cracks in these mechanisms, the the rain will not run off the roof like it is supposed to, and will instead flow back into the home. 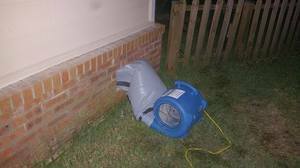 If there are any cracks in the home’s foundation, and the downspout is causing the rainwater to flow away sufficiently from the property, then the water can seep inside the walls, causing wood rot, structural damage or even a mold infestation. Most L.A. homes do not have basements, but in the rare case that you do, a high water table can become over saturated by the rainfall, causing excess water to flood these underground spaces. Rainstorms can also overload older plumbing systems and septic tanks, creating pipe bursts that will allow hundreds of gallons of water or sewage to flood the property in a short period of time. After a storm, the most important, and most obvious, step that needs to be taken when your home has been flooded is to extract all the water. Not only will this limit the amount of water damage, but it will prevent mold from having enough time to infest the premises. The extent of the leak or flood will determine what method should be used to extract the water. Sometimes all you will need are some heavy towels and a few fans, where other jobs may require a wet vac, dehumidifiers and air movers. If any rugs or furniture have been soaked by the rain, then it is best to remove them from the affected room and put them outside or in a dry, ventilated area. Not only will this speed up the drying time, but it will increase your chances of salvaging the items. 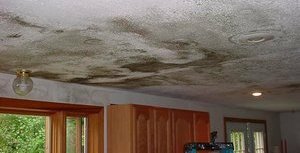 Once the area is completely moisture-free, then you can begin work on repairing the cause of the leak or flood. For example, if there were cracks in the roof, then they can now be patched up, or if a pipe burst in the garage, then a new plumbing system can be installed. Only you will be able to decide if the water damage is manageable enough for you to repair on your own, or if it’s so extensive that it will require a professional hand, but either way, acting fast is key.